Only in a "Star Trek" movie do you wish the action would stop and the bickering would begin. The dynamic between Kirk, Spock and “Bones” McCoy remains the Dilithium crystal that power 50 years of “Trek” tales. “Star Trek Beyond” understands that all too well. So while “Trek” purists may gripe over the film’s “Fast & Furious” glow, the story always goes back to the characters we’ve loved for decades. It’s laced with humor and the understanding this is more than another space romp. And that’s a very healthy thing. Particularly when some of the action beats mirror the most maddeningly elements of the modern blockbuster. 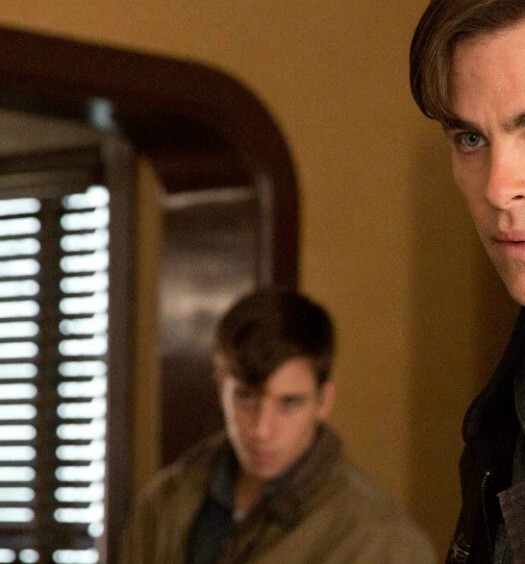 “Star Trek Beyond” begins on a contemplative note. We’re in the third year of the Starship Enterprise’s five-year mission. The ship’s captain understands the toll that is taking on his crew. James T. Kirk (Chris Pine) is nothing if not aware of the big picture. He might even prefer to take a desk job at this point. He’s still wondering why he needs his own ship above and beyond lingering daddy issues. FAST FACT: Justin Lin considers “The Enterprise Incident” one of his favorite original “Star Trek” episodes. Those ruminations, better expressed in “Star Trek II: The Wrath of Khan,” get shoved aside when the Enterprise is lured into a trap. An alien’s swarm of drones pound the storied ship. Soon, the pride of Starfleet is crippled. And the surviving crew must flee to an unknown planet just to stay alive. Director Justin Lin captures these nightmarish moments in a way we haven’t seen over the saga’s 50 year run. And he’s just warming up. We soon meet the creature behind the savage attack. Krall (Idris Elba buried under practical makeup FX) wants to teach the Federation a lesson. And he doesn’t care what needs to happen along the way. Elba’s character won’t join the pantheon of killer “Trek” foes. 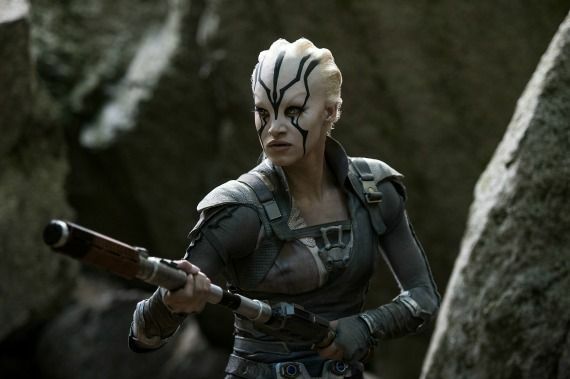 We’re far more invested in Jaylah, an alien who provides an unlikely ally for our scattered heroes. Sofia Boutella gives the character not just sass but a strut we’d love to see again. She’s a three dimensional soul who fits beautiful with the characters we know by heart. Lin’s first “Trek” captures the wonders of space, the pageantry of living together as one, in a way that’s visually profound. Adding anything bold to a musty property is an accomplishment. Lin does so via the film’s first act. We see camera angles that make us grin, capturing aliens and humans interacting as one. Even the Enterprise, the big, glorious ship of our youth, is lovingly rendered. The movie marshals modern FX to make it all possible, connecting with the saga’s Prime Creative Directive. And then it uses those very effects to snuff the soul out of the story. That opening action sequence is a blast. The following set pieces? A crush of CGI wizardry that swallows the narrative up whole. A protracted sequence featuring Kirk on a motorcycle feels like it came from a bad video game movie. Death hangs over the franchise now, in a way that occasionally barges into the frame. Co-star Anton Yelchin died weeks before the film’s release. That renders his final “Trek” time as Chekov feel mournful, not electric given his feisty attitude. The film even connects to another off-screen death in a way that’s genuinely moving. 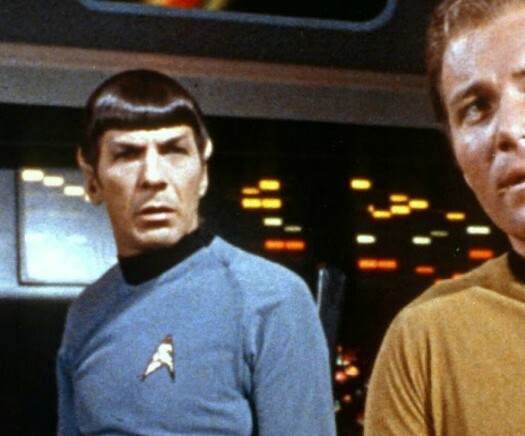 Leonard Nimoy’s passing gets a sentimental screen moment. What hasn’t changed is the saga’s “Kumbaya” attitude. Together, we’re stronger, Gene Roddenberry argued oh, so many years ago. That’s directly reflected here. It’s a wonderful sentiment when not attached to any geo-political realities. Still, as hopeful science fiction visions go, we could do a lot worse. And the much-discussed “Gay Sulu” moment, delivered quietly by John Cho, is woven gently into the narrative. The first new “Trek” movie’s casting proved prosperous. And that chemistry set still matters. Karl Urban may be the reboot’s MVP. His Bones is as crotchety as the real McCoy, but it rarely feels forced. He’s the realist in the bunch. Here we are talking about a gazillion dollar sci-fi franchise, and the conversation keeps coming back to the characters, the canon and where they go from here. That means “Star Trek Beyond” did something right.